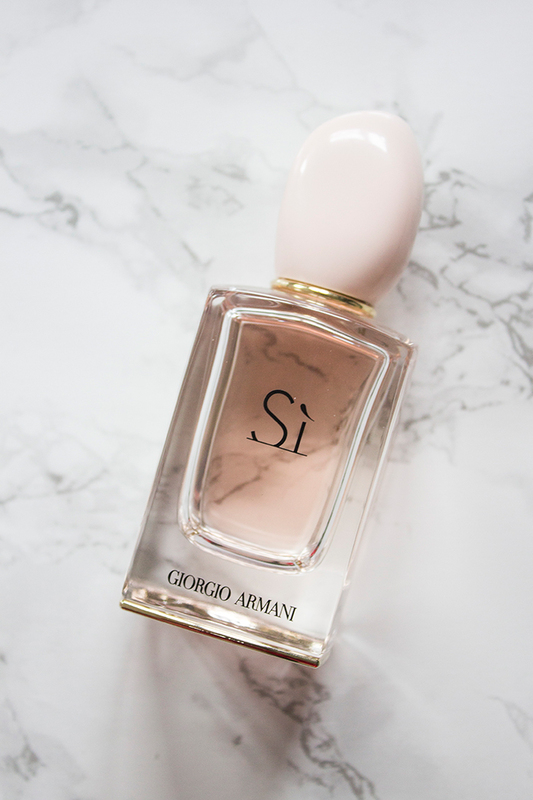 Spring/Summer is always one of the best times for new fragrances and one I can't get enough of is the Giorgio Armani Si Perfume. If you like sophisticated yet sweet scents, this is the fragrance for you. Lets start off with the packaging. First thing I noticed that it actually weighs a ton, from the glass bottle to even the lid. I really like the simple, elegant look as it's something that looks really nice on display. It's not over the top or too attention grabbing which I believe most people will like. Moving onto the scent it features notes of Blackcurrant Sorbet, Mandarin & Pear on the top, Rose de Mai Essence & Freesia on the heart and Musk, Vanilla & Patchouli as the base notes. Although it does seem to have quite a heavy fruity assortment of scents, personally I don't find it to be that kind of scent at all. The notes that seem to stand out to me are blackcurrant, slight hint of rose and musk. If I had to compare it to any other scents or products I'd say it's pretty close to Guerlain's La Petite Robe Noir or Lush's Ro's Argan Body Conditioner, which Lisa agrees with me on. If you're a fan of perfumes such as Lancome La Vie Est Belle or Viktor&Rolf Flowerbomb, you'll like this. I'd say this fragrance is probably best for those aged 20 and above. For me it's just the right amount of natural sweetness but I do think it's perfectly suitable for older women too. If you're looking to buy a perfume as a gift, it's a pretty safe bet!